The Model 8501 Piezoelectric Accelerometer is a completely self-contained vibration measuring system having a built-in amplifier within the housing. It is designed for the measurement of low level, broadband frequency vibrations. This unit incorporates a hybrid electronic assembly within a rugged, welded, double-wall stainless steel body to enhance its operation in humid and dirty environments. The double-wall, electrically isolated construction provides additional isolation from metallic structures, which aids in acquiring accurate, wideband shock and vibration data uncorrupted by electrical ground loop currents. 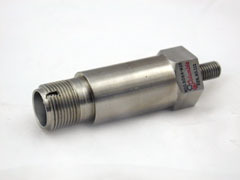 The sensor module is bonded into the outer stainless steel body with a high performance epoxy. Internal electrical damping limits the resonant Q to less than 18 dB. Low impedance output of 100 ohms or less allows operation directly into standard readout equipment without auxiliary signal conditioning, and is capable of driving up to 1,000 feet of shielded cable. At +75 Deg F, 10g Peak, 100Hz; Power Supply 2 To 10 mA DC Constant Current with 18 To 30 VDC Compliance. 0.5 x 10-3 g Equiv., Nom.